"Let us not delude ourselves into thinking that the rest of the world believes ICANN is a critical institution." "... explain to me how the same demand doesn't lead the rest of the interested world to decide ICANN is too broken to be reformed, and to route around the damage it represents." 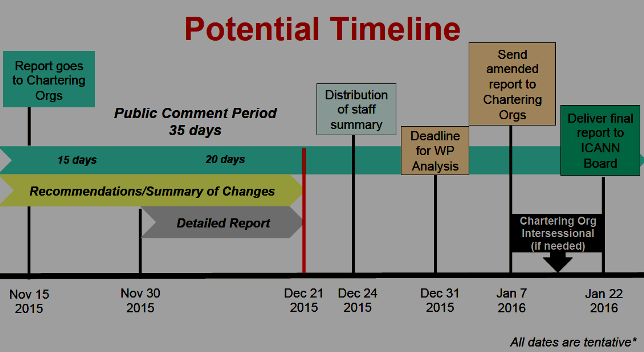 "Either we deliver, or ICANN's internal processes are revealed to be fruitlessly ineffective." "If ICANN's processes are effective or not. I know they have never been and are not. But that does not mean the end justifies the means." > +1 Time to wrap this up. > I disagree, the charter does does not say, ship something, anything, to make the transition happen, it says what accountability measures must happen so that (before) the transition can happen, and which ones can wait until after it has happened. >That's nice. But I would like someone to tell me a plausible story under which this CCWG doesn't ship something such that the transition happens, and yet the desired accountability measures happen. Or, for that matter, where IANA holds together. Let us not delude ourselves into thinking that the rest of the world believes ICANN is a critical institution. The three operational communities -- one of them part of ICANN! -- have all come up with a mechanism in which ICANN and IANA are separated. 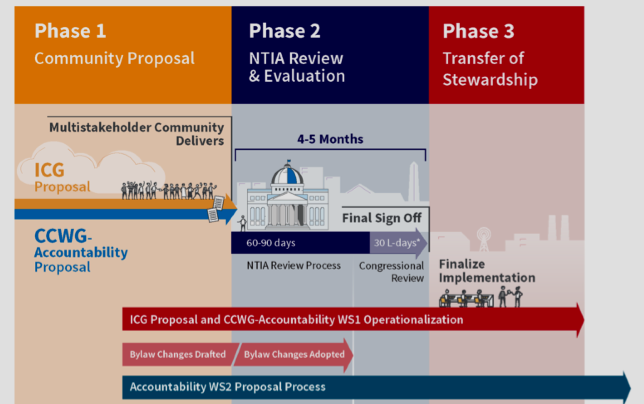 If the ICANN community cannot find a way to satisfy itself that it has the accountability measures it needs, then the obvious answer is to find some other way to achieve the IANA functions. Having already imagined it, we can certainly reach that outcome. Yet the operational communities all express satisfaction to date with ICANN's performance. I think it'd be a shameful negligence of our duty were we to allow satisfied communities to go seek other options just because we squabble. But I think we should not be sanguine that IANA will remain untouched if we should fail to deliver. The community pressures are too great. Something will change. We can be responsible enablers of that change, or we can stand by stupefied while it happens. That is up to us. >Yeah, right, toss all accountability, make it happen. Not. >Really? What's your leverage? Suppose that this CCWG does not deliver next week, such that there is a report that can be adopted by the chartering organizations no later than Marrakech [ICANN55 March 5-10]. In that case, what reason does the board have to adopt even one resolution making any of the proposed changes? If your answer is, "Too much pent up demand," then explain to me how the same demand doesn't lead the rest of the interested world to decide ICANN is too broken to be reformed, and to route around the damage it represents. We are no longer free to fail and be ignored. Either we deliver, or ICANN's internal processes are revealed to be fruitlessly ineffective. Let's not pretend. >Leverage? Interesting. I was asked to do it right. Implicitly by being appointed to this CCWG Accountability. 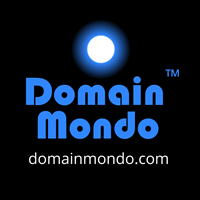 And I feel it is as legitimate to look out for the smaller ccTLDs' interests as for business' or governments'. If ICANN's processes are effective or not. I know they have never been and are not. But that does not mean the end justifies the means.